Liu Shan takes over the Shu kingdom after Liu Bei's death. He is left to defend Shu's land after an invasion from Wu at Bai Di Castle. Furthermore, Zhuge Liang is busy at Wu Zhang Plains and is unable to help Liu Shan. Only Ma Chao, Huang Zhong, Jiang Wei and Xing Cai remain to guard him. 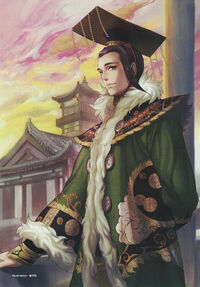 Liu Shan is depicted as gentle, weak and untrained. Lovestruck by the maiden, he sorely wishes for Xing Cai to stay behind and wishes he had Guan Ping's strength so he can properly protect her. During the battle, he will rush to her aid should her health drop to low levels. After the battle, however, he vows to grow stronger to protect his people during Shu's scenarios. Xing Cai's ending scene shows Liu Shan struggling to train with her. His fate in other scenarios is not clearly mentioned.